A newly released review by The World Organisation for Animal Health (OIE) has exposed serious problems with Canada’s veterinary services – the Canadian Food Inspection Agency (CFIA) in particular. The review is based on an inspection which was conducted by a team of four OIE certified evaluators from March 13-31, 2017. The review pays considerable attention to the CFIA, noting that it is the agency responsible for enforcing the regulations governing both animal transport and slaughter at federal slaughter plants. 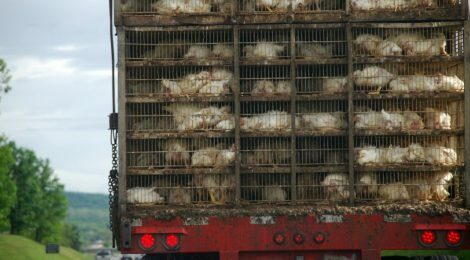 Regarding the CFIA’s work on animal transport, the OIE flagged the agency’s failure to update the regulations for over 10 years, and expressed surprise that “Some politically powerful lobby groups are able to modify technical decisions”, noting that when the CFIA finally proposed reducing the maximum transport times animals could legally be transported without food, water or rest, that the agency was ‘persuaded’ by the livestock and poultry industries to bump the numbers back up “because of negative economic impacts”. The OIE pointed out that the final proposed transport regulations (developed to the tastes of industry) fail to meet OIE standards and urged the CFIA to develop animal transport regulations based on documented evidence, and finalize and enact them independent of industry. Given that Canada has a stated policy of increasing agricultural exports by 40%, even more animals will continue to be transported and killed under conditions considered inhumane by OIE’s standards unless something changes. Tell Jaspinder Komal, the Chief Veterinary Officer of the CFIA, to follow the OIE’s recommendation to reduce maximum transport times for all species and put the interests of the animals his agency is charged with protecting before the financial interests of industry.